On Arrival: Sparkling turquoise seas, the verdant northern coastline, dazzling sunrises, tropical flowers and lush vegetation welcome you to Cabarita Lookout. Relax by the sparkling pool, enjoy a massage by Racquel, our in-house board-certified masseuse, dine under the stars and step into a new way to vacation. 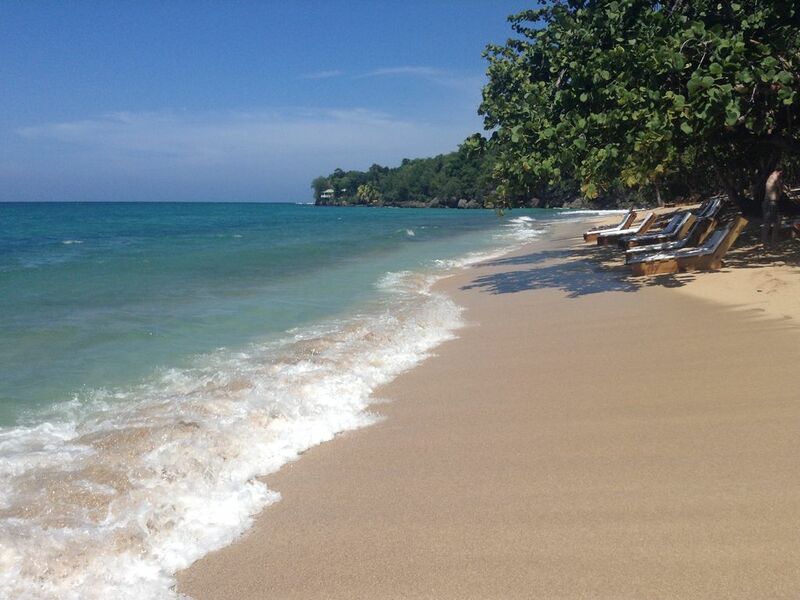 Escape the hustle and bustle of super clubs and tourism and enjoy your new home in Jamaica. Our villa was completed in 2009 on the historic Wentworth estate, known to be the illustrious Captain Henry Morgan’s historic lookout and sitting adjacent to playwright Noel Coward’s dramatic estate “Firefly.' 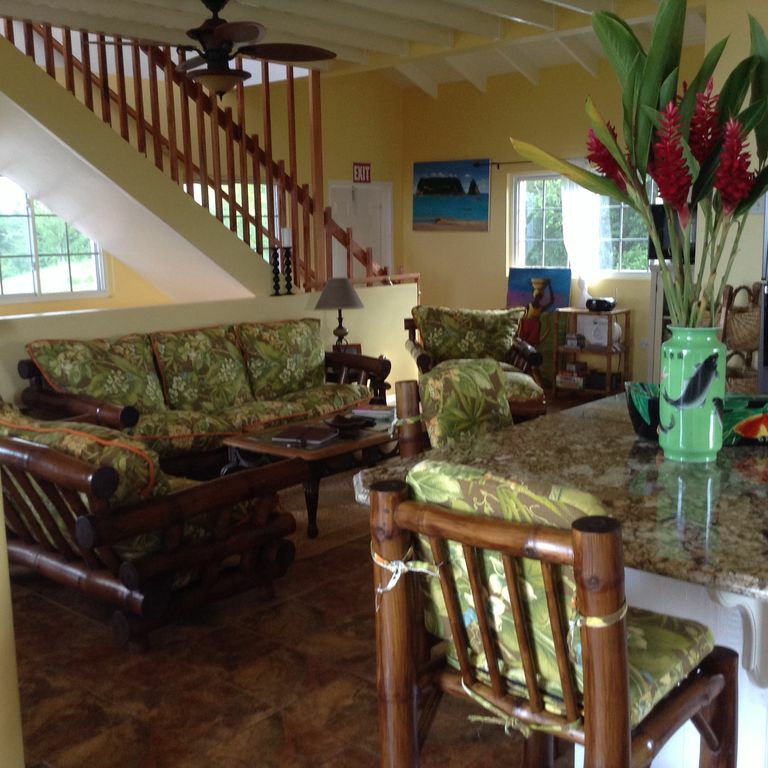 Elegant yet cozy, we want our home to be your “home away from home.” On your arrival, you’ll be greeted by Cutty, your driver and new “best friend.” Cutty has a wealth of knowledge about Jamaica and will be happy to share the lore of his land. When arriving at the villa, you’ll be greeted with a rum punch by Sharon, both a fabulous cook and meticulous housekeeper. Breathtaking views await you. Our Location: Cabarita Lookout is located in close proximity to James Bond Beach, Dunn’s River Falls, Dolphin Cove, The Blue Hole, Reggae Beach and Fern Gully. For the more adventuresome, try rafting the White River, exploring Black Sands Beach or deep sea fishing with local fishermen. Or just kick back and relax around our sparkling pool. Sharon’s cuisine ranges from local to international. You are free to design your own menu. A Private Getaway: Cabarita Lookout comfortably sleeps three families or three couples with extra beds available. The van and driver are available 7 am to 9 pm during your stay. Whether you are looking for an active family vacation loaded with activities for you and your kids or just a quiet private getaway with friends, Cabarita Lookout promises memories you’ll treasure forever. 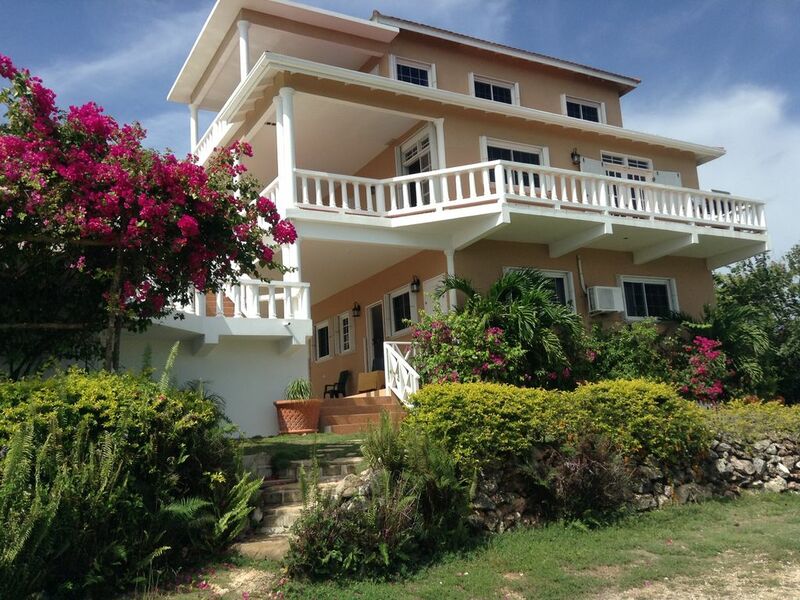 Lush tropical flowers and fruit trees add to the beauty of our villa. Blue on blue on blue. Pristine pool, relaxing seaview. 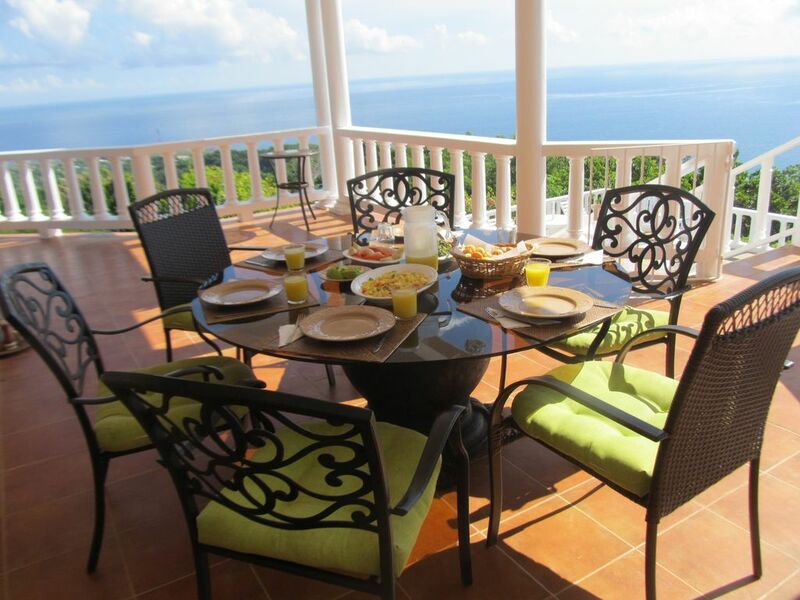 Breakfast on the veranda is full of views and delicious food!! 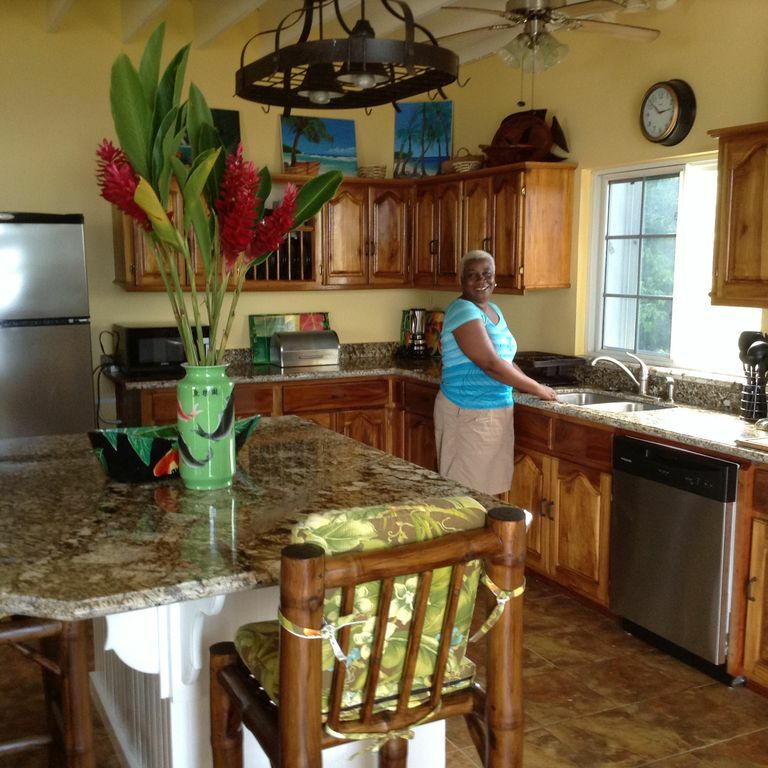 Sharon, our cook, serves delectable Jamaican cuisine as well as continental. The villa's living room is cozy and welcoming! TV, games, music. The villa's dining room table seats ten persons comfortably. 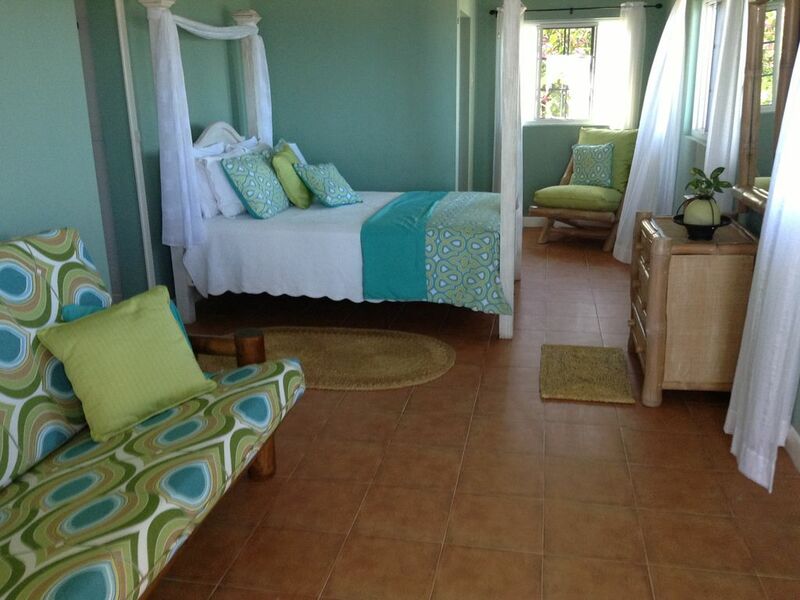 The Seascape Suite features a queen bed and drop down sofa with 2 twin beds. 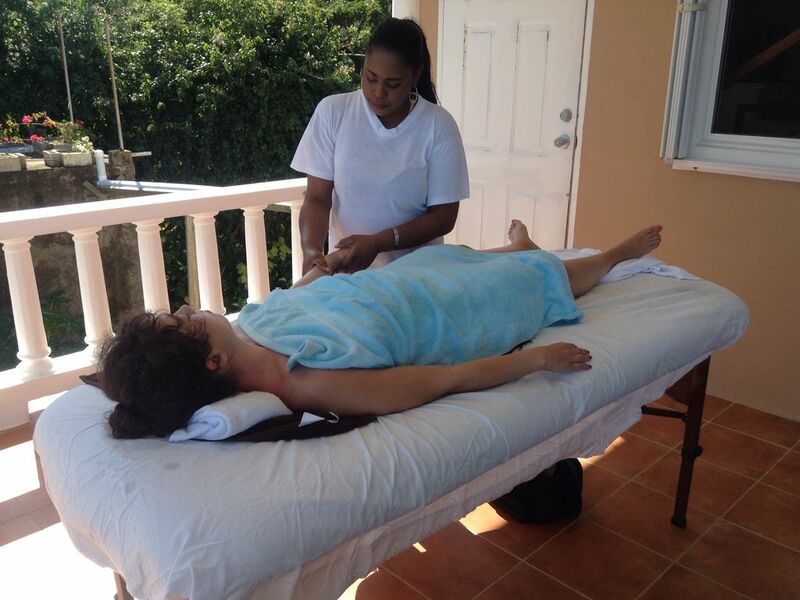 Racquel, our masseuse, is a certified massage therapist and reflexologist. 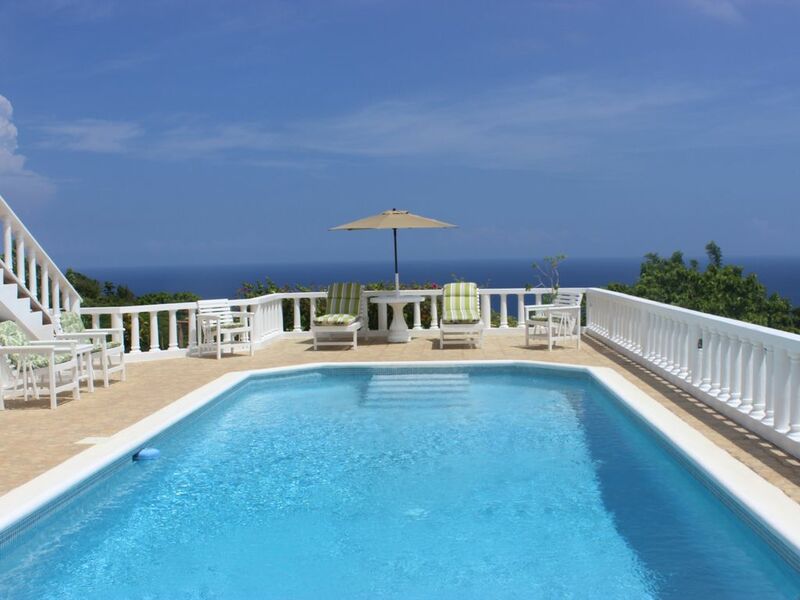 Panoramic views, cool sea breezes, a dip in the pool...sit back and relax! Bamboo Beach Club provides chaises, chairs and great dining! Our favorite beach! Rafting the White River is a beautiful way to spend an afternoon! 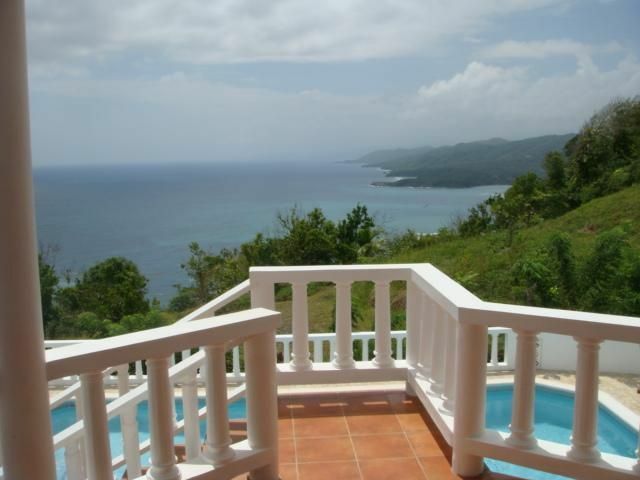 View Jamaica's northern coastline from your private veranda at Cabarita Lookout! 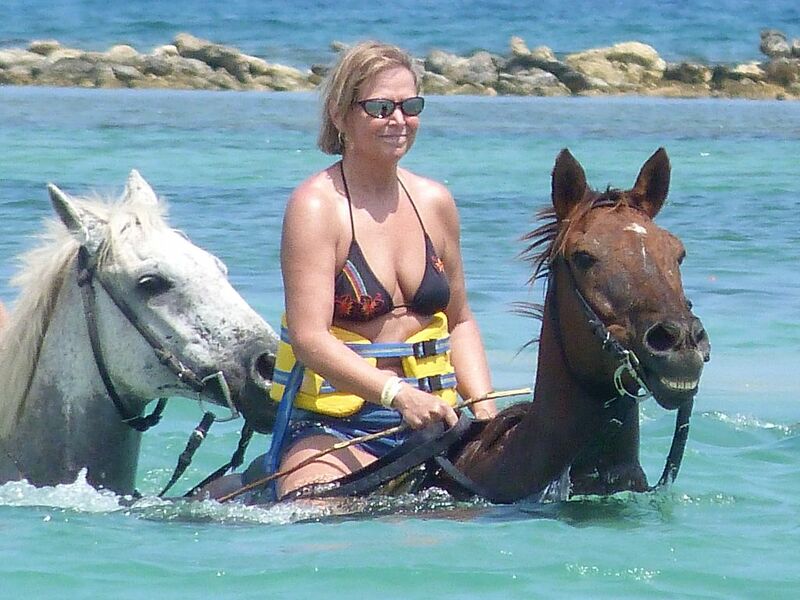 Check out the smile on the brown horse's face!! He loves Jamaica too! 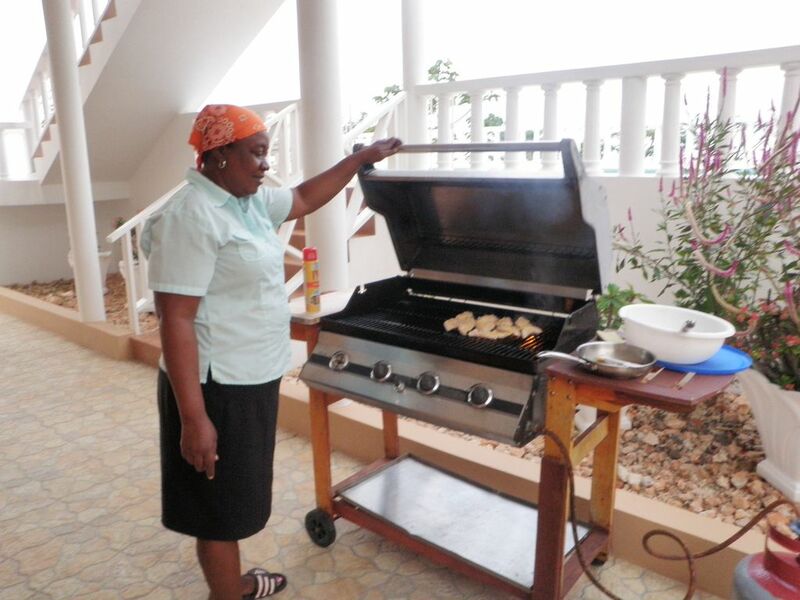 Sharon, our villa's cook, checks out her jerk chicken! Have you seen a turtle hatch? Ask us about arranging an experience! Cabarita Lookout's weekly rate of $2190 (May-November), $2790 (December-April) is for up to 6 guests. Over 6 guests, please add $250 per guest per stay. This fee includes an 8-passenger van and driver, cook and housekeeper. A complimentary dinner and breakfast on arrival. After complimentary meals, traveler pays for groceries. Airport transfers included, traveler pays additional fuel for side trips. The Villa was amazing the staff was amazing also Cutty,Sharon,AnnaMaria.and Devon were all so accommodating we loved our time there. Thanks for a great trip!! 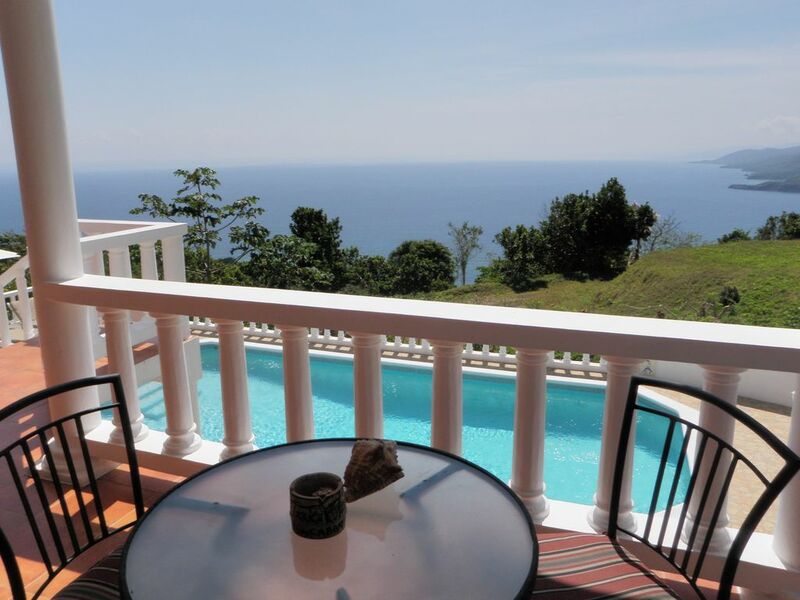 Beautiful villa w/ stunning views & amazing staff! 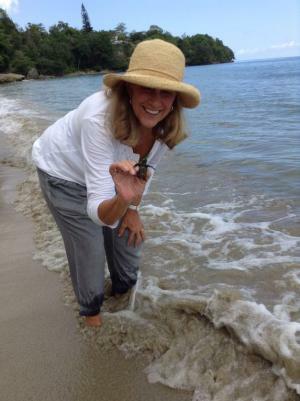 My family and I had a truly wonderful and memorable experience in Cabarita and Jamaica. The villa itself reflected the love and care of its owners, and we instantly felt welcomed and at home. Cabarita\'s staff is amazing! Our experience in the villa was made all the more comfortable by Sharon and Paula’s spectacular cooking, caretaking and warmth. Cutty is a well of information and all around wonderful to have around. We were very sad to leave and when we were dropped off at the airport the my 6-year old nephew saluted Cutty and stated, “all hail to Cutty”! The children are still talking about the beautiful villa, Johnny Cakes, bread pudding and catching geckos! And the grownups are so grateful for being so wonderfully spoilt! Secluded and Relaxing Experience. Great vacation and great staff support while there. Great vacation with unbelievable views from anywhere on the property. Cuddy and Sharon are great. We were able to take trips to a few village towns that had isolated beaches (we were the only ones there) with sandy sea bottoms and clear blue water. These beaches even served drinks and had hot food available. The 5 of us were very comfortable (2 teens, 1 young adult, and 2 adults) in the house and while being driven to our daily destination. I would recommend not doing all the highly populated destinations and find a trip or 2 that take you off the beaten path. This scores a 10 out of 10 for our family. The home is located at the top of the hill with views that are so incredible. The home is appointed very nicely and was very comfortable for our family. We traveled with a party of 7. The staff could not have been more accommodating. Sharon and Paula were wonderful. Sharon\'s meals were wonderful; in particular her curried goat! Cutty is an invaluable source of information and always ready to take us wherever we needed with a smile. Really a dream vacation. We will definitely go back. Cabarita Lookout is everything the website says and more. 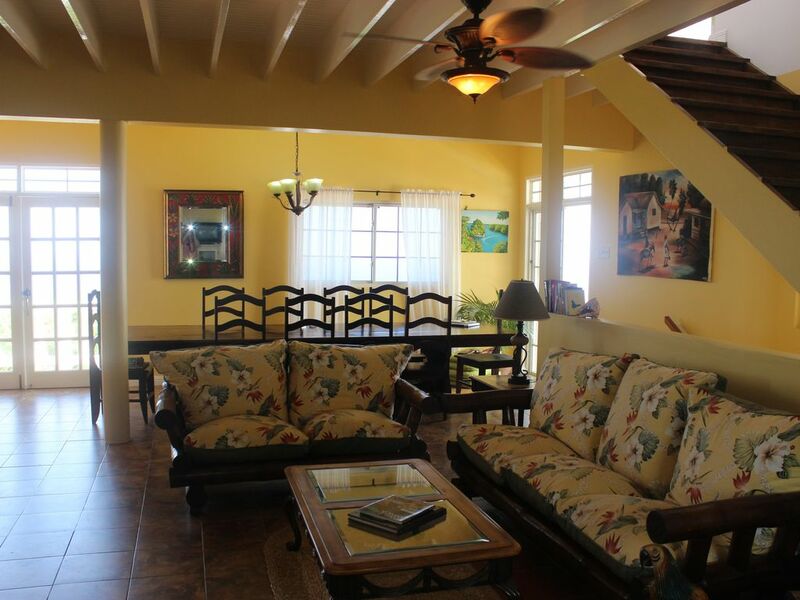 Beautiful villa with plenty of room and privacy for 5 of us. Sharon\'s breakfasts and dinners were superb. Gourmet with fresh, local fruit. Cutty, the driver of our van, is so nice and helpful. He suggested places to go and got us there and back in air conditioned van. Great side trips. Don\'t miss the Noel Coward Museum next door. And it was relaxing sitting poolside and just reading. The whole family will love this. Chuck in Broomfield, CO.